Apparently they are growing unicorn horns. Or at least that's what this sign makes me think. and running while hula hooping? 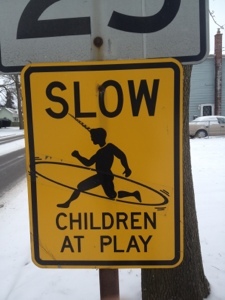 I admit that it's a hula-hoop, but my first glance saw a narwhal child running with a surfboard. I would totally slow down for that. I'm pretty sure that's a toilet plunger hat. It does look a lot like a surfboard. I think the hula-hoop is an old string cheese incident sticker. I think of other things when I see those signs..non-PC things.